By the nature of where it spends its life, outdoor furniture has to be designed, first and foremost, to withstand its toughest enemy—the elements. While makers of indoor furniture need to consider the swelling and contraction of wood due to seasonal changes in relative humidity, outdoor furniture builders must also allow for the fact that their pieces will occasionally be drenched in water, dried by the wind, and baked by the sun. With appropriate materials, design, joinery, and hardware, you can fashion pieces that will be as durable and longlasting as any kitchen side chair or bedroom armoire. Choose a project by reviewing some of the styles and types of outdoor pieces that have been popular with woodworkers, as shown on pages 14 and 15. Your next concern should be selecting a wood species that is naturally decay-resistant. Several native species fit the bill, such as Northern white cedar and redwood, as do some imported ones, like teak. The chart on page 16 rates various woods in terms of their capacity to weather the outdoors. Since most of these species are softwoods, which are generally sold as dimensioned lumber, your projects will be more economical if you design them on the basis of their available dimensions. Refer to page 17 for information on calculating how much stock you will need. Two coats of waterproofpolyure-thane provide an extra measure of protection for an Adirondack chair made from Northern white cedar, a decay-resistant wood. Keep in mind that some of the same substances in decay-resistant woods that ward off rot can also give rise to allergic reations in builders and users. Redwood, for example, can cause respiratory ailments, while teak can produce skin and eye allergies. 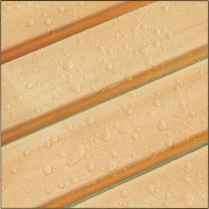 Western red cedar has been known in some cases to trigger all three types of reaction. Your second line of defense against the elements is the joinery you select. A basic rule is to avoid joints that will trap water that will eventually rot the wood when the weather is warm, or split the joint apart when it freezes in cold weather. Many outdoor pieces rely on joints like the half-lap that, when reinforced by screws and glue, are sufficiently durable while allowing water to drain away. Any hardware you use, whether screws, bolts, or knockdown fittings, should be stainless steel to avoid rust. You should also use waterproof adhesives, such as epoxy or resorcinol. For more detail on the types of joints, hardware, and glues appropriate for outdoor furniture, turn to pages 18 and 19. Once your outdoor piece is ready for the yard or garden, the last step is to coat it with a weather-resistant finish. Pages 20 and 21 present information on the variety of finishes suitable for the outdoors, from glossy polyurethanes to a natural, unvarnished finish. A coating of spar varnish is brushed onto a back slat of the backyard bench shown at left. To help you apply an even coat that will shield the piece from the elements, use a good-quality brush.